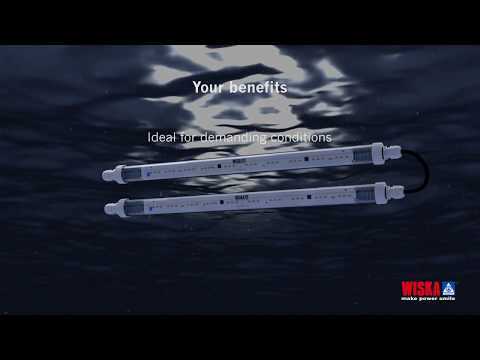 With the LED multi-purpose luminaire 4000, WISKA has developed the perfect lighting solution for use in the maritime industry and the offshore sector. The innovative luminaire is DNV GL certified and, like all WISKA products, stands for the highest “made in Germany” quality. Beyond excelling the high requirements of maritime lighting, the LED multi-purpose luminaire 4000 reduces maintenance costs to zero. The reason for that is simple: The luminaire dispenses of a driver, which considerably minimises the risk of failure. With only reduced components and no additional lighting fixture housing, assembly and installation of the LED multi-purpose luminaire 4000 go straightforward. The lighting system has been tried and tested in thousands of operating hours and provides reliable working light regardless of even roughest conditions. Depending on the application and lighting requirements, the LED multi-purpose luminaire 4000 is available with one or two tubes and with different assembly setups.